On this day in dinosaurs, Ernst Freiherr Stromer von Reichenbach reached Egypt’s Bahariya Oasis for the first time. Stromer, a German baron, developed a passion for Egyptian paleontology. 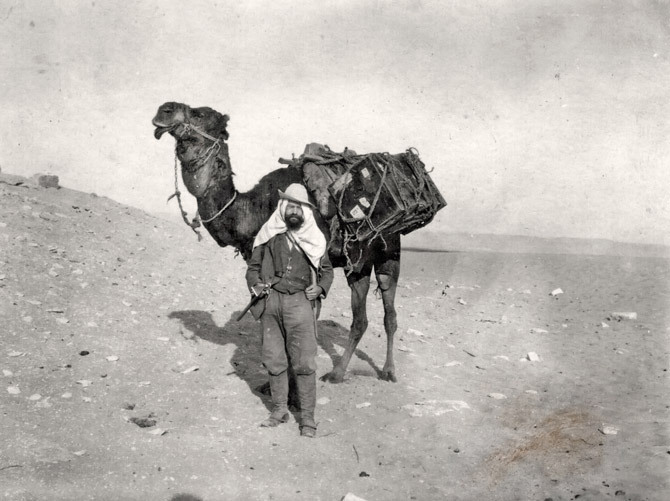 He mounted several expeditions to Egypt in the early 1900s, but it was his 1911 trip that made him famous among dinophiles. Equipped to deal with small mammal and reptile fossils, Stromer did not have the tools or the means to move huge dinosaur remains. He was only able to collect some of the bones that he found. Other fossils were too delicate from exposure to the elements or simply too difficult for Stromer to take back to Germany. Several weeks after he discovered Egyptian dinosaurs, Stromer returned to Bavaria. He would spend years publishing on the remarkable fossils he’d excavated in the Bahariya Oasis. A year after this trip, Stromer was sent additional fossil material from the Sahara–bones that he would name Spinosaurus aegypticus, his most enduring and exciting dinosaur. As we’ll see later this year as our journey through dinosaur history continues, the story of Stromer and Spinosaurus is not without tragedy. But for today, let’s remember the joy Stromer must have felt in reaching a new fossil-bearing locality that would produce the remains of Aegyptosaurus, Bahariasaurus, and Carcharodontosaurus–the very first of Egypt’s dinosaurs. Share your favorite photos of Stromer and Spinosaurus on Facebook and Twitter using the hashtag #TDIDinos.